Trinidad & Tobago offer a fantastically cosmopolitan mix of cultures. From dancing to calypsoes at the Trinidad carnival to relaxing in one of Tobago's glorious bays, they make a fascinating travel destination. Footprint's Handbook provides invaluable information on transport, accommodation, eating and entertainment to ensure that your trip includes the best of these diverse islands. Essentials section with useful advice on getting to and around Trinidad and Tobago. Comprehensive, up-to-date listings of where to eat, sleep and 'lime'. Includes information on tour operators and activities, from spotting wildlife in the wetlands to snorkelling in clear, coral-filled waters. 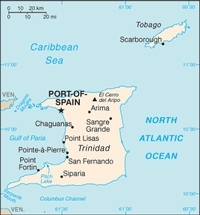 Detailed maps for Trinidad and Tobago. Slim enough to fit in your pocket. The Rough Guide to Trinidad and Tobago is the definitive guide to these high-spirited twin islands. White-sand beaches, swaying palms and reef-studded waters are all here for the taking, but Trinidad and Tobago turns the Caribbean stereotype on its head, offering a whole lot more than sun and beachlife. The Rough Guide to Trinidad and Tobago gives you insider information on everything from watching leatherback turtles lay eggs on the beaches, to navigating the multitude of Carnival fetes and Calypso tents and playing “mas” on the streets of Port of Spain. Up-to-date listings and tips give you the lowdown on the islands’ brilliant dining and nightlife scenes. And from boutique hotels on the sand to budget rooms, local guesthouses to lavish villas, our accommodation reviews will help you find a room that suits your needs. Whether your tastes are striking out on rainforest hikes, cooling off in hidden waterfalls, or exploring Hindu temples and Indo-Trinidadian food, The Rough Guide to Trinidad and Tobago will ensure you get the very best out of your stay. Dieses Urlaubshandbuch führt zu den südlichsten Karibikinseln. Egal ob man seine Traumreise fest gebucht hat, oder ob man sie sich erst unterwegs zusammenstellt, alle nur erdenklichen Hinweise zu Unterkunft, Verpflegung, Verkehrsmitteln, zu Sehens- und Erlebenswertem sind in diesem Buch versammelt. Einen besonderen Stellenwert hat dabei natürlich der Karneval auf Trinidad und besonders in der Hauptstadt Port of Spain. Für den Sonnen- und Strandurlauber gibt es wertvolle Tipps zu den schönsten Stränden, aber auch Hinweise auf Küstenabschnitte die man - etwa wegen der Ölindustrie - meiden sollte. This is the definitive guide to the birds of these two lovely Caribbean islands. Lying close to the Venezuelan coast, Trinidad and Tobago hold many Neotropical species not found elsewhere in the Caribbean, and have a total bird list of over 450 species, making the pair of islands one of the most bird-rich countries per square mile in the world. Unsurprisingly, the islands are extremely popular with birders. This guide covers all species resident in or regularly visiting the islands. As well as field identification, it deals with habitats and status, range and subspecies, diet, nesting and behaviour. The introduction looks at the general ecology and history of ornithology in the islands. About the Author(s): Richard ffrench first visited Trinidad in 1955 and subsequently taught there until his retirement. He is the acknowledged authority on the islands' birds and his best-selling guide has been in print continuously since 1973. The Caribbean islands of Trinidad and Tobago provide a fascinating opportunity for anyone interested in natural history, particularly birds. Trinidad's position, a mere ten miles from the South American mainland, means that its flora and fauna are essentially continental by nature. This second edition has been completely revised and updated and features 106 species of birds. Trinidad & Tobago are popular tourist destinations and the islands are also a top location for visiting birders. This comprehensive and portable field guide covers every species found on the islands. The concise text includes descriptions of every species, highlighting plumage variation and distinctions from similar species. The plates use the relevant images from Birds of Northern South America to create new plates specific for Trinidad & Tobago. This new edition has been completely revised. The plates have been extensively re-worked, with many images replaced and repainted. As a result, there are now eight extra plates, and some groups, such as flycatchers, have been repainted almost in entirety. The text has also been updated. This new edition supersedes all previous field guides to these popular islands. This brand new field guide uses the relevant images from Birds of Northern South America to create new plates specific for Trinidad and Tobago. The text is new and has been written specifically to assist in the field identification of every species that occurs on Trinidad. About the Author(s): Robin Restall is the illustrator of Birds of Northern South America and lives in Venezuela. Martyn Kenefick lives in Trinidad where he is a professional bird guide. Floyd Hayes is an American who teaches at the university on Trinidad.